Manjaro also offers several official Manjaro repositories that are hosted on Software Servers throughout the world. The closest server near you may be the fastest. Let's fish it! For some reason, if your Manjaro is not downloading the package updates at good internet speed, chances are it could be connected to a slow server. 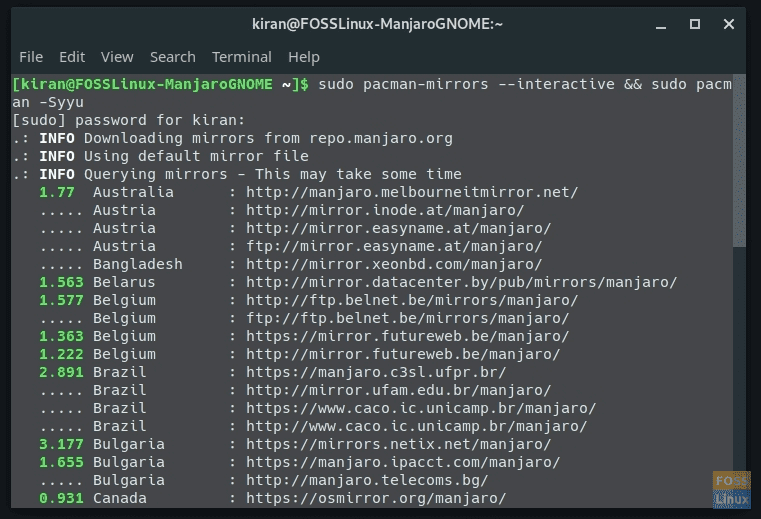 Like most of the Linux distributions, Manjaro also offers several official Manjaro repositories that are hosted on Software Servers throughout the world. Looking at the list, it’s a no brainer to point out the first two factors are not entirely in your control. All you can do is select the closest and fastest download server in your area. In this guide, we will look at how to find out the closest official Manjaro download server. The above command will fetch and add each and every mirror to the list which could take some time. To optionally limit the number of mirrors being fetched, add a number after —fasttrack. Here is an example to limit to 10 mirrors. Now that you know which is the best server, you may want to set it as preferred download server for all future system updates. The following command is similar to –fasttrack, except it now works in interactive mode. You will be able to choose your preferred mirrors. After fetching the server list, you will be able to select the server. Click on the desired server checkbox and click “OK”. To apply the new mirror list to your system such that pacman will start using it for next updates, you must synchronize the database. 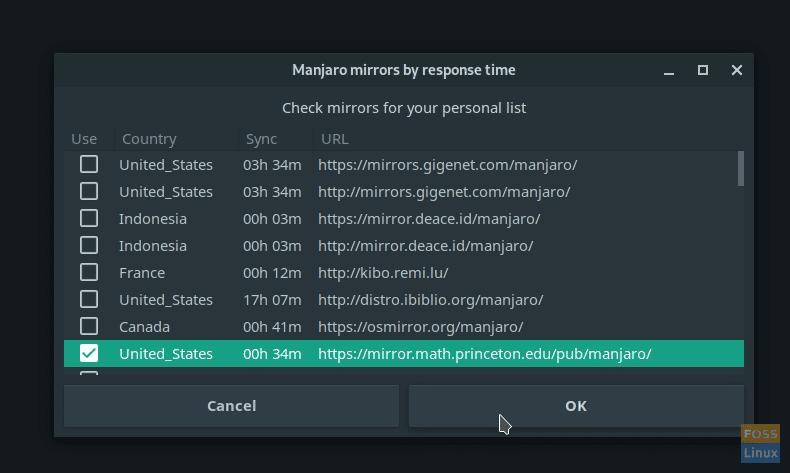 This will ensure that your Manjaro’s database is up to date and will help avoid any potential packages download problems later on. That’s it! The settings change is applied instantly. There is no need to reboot. Hi there! I'm Kiran Kumar, founder of FOSSLinux.com. I'm an avid Linux lover and enjoy hands-on with new promising distros. Currently, I'm using Ubuntu as a daily driver and run several other distros such as Fedora, Solus, Manjaro, Debian, and some new ones on my test PC and virtual machines. I have a day job as an Engineer, and this website is one of my favorite past time activities especially during Winter ;). When I'm not writing for FOSSLinux, I'm seen biking and hiking on scenic trails. Hope you enjoy using this website as much as I do writing for it. Feedback from readers is something that inspires me to do more, and spread Linux love!. If you find a time, drop me an email or feedback from the 'Contact' page. Or simply leave a comment below if you found this article useful. Have a good day! Shutdown Timer is a useful GNOME extension that lets you easily schedule automatic shutdown conveniently from the system tray menu. When it comes to elegant looking operating systems, there is no doubt that Apple's Mac OS is one of the top contenders. You can make your Manjaro XFCE look like MacOS including the juicy icons in a few simple steps.